This is a professional grade miniaturized target made in cooperation with Munsell Color Services from the same pigmented color paints as the discontinued Mini ColorChecker but at about 1/3 the size. It has the identical 18 color patches as the GretagMacbeth™ ColorChecker®, plus 12 spectrally neutral gray patches to assess correct exposure and white balance in close-up or macro photography applications. (These are NOT ink-jet, photographic, or electro-photographic generated colorants). The patches are mounted on aircraft grade anodized aluminum and are set below the top surface to help protect from damage. The center gray patches are available with either gloss or matte. All colored patches on the perimeter are matte finish. Because these targets are hand cut and assembled, very minor patch mis-alignments may occur. They do not affect the target’s utility. This is a professional grade miniaturized target made in cooperation with Munsell Color Services from the same pigmented color paints as the discontinued Mini ColorChecker. 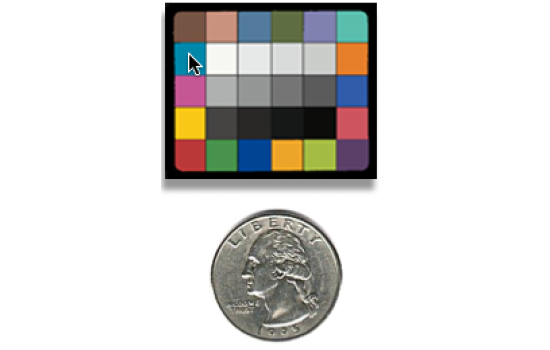 It has the identical 18 color patches as the GretagMacbeth™ ColorChecker®, plus 12 spectrally neutral gray patches to assess correct exposure and white balance in close-up or macro photography applications. (These are NOT ink-jet, photographic, or electro-photographic generated colorants). The patches are mounted on aircraft grade anodized aluminum and are set below the top surface to help protect from damage. All colored patches on the perimeter are matte finish and the center grey patches are available in a matte or gloss finish. Because these targets are hand cut and assembled, very minor patch mis-alignments may occur. They do not affect the target’s utility. 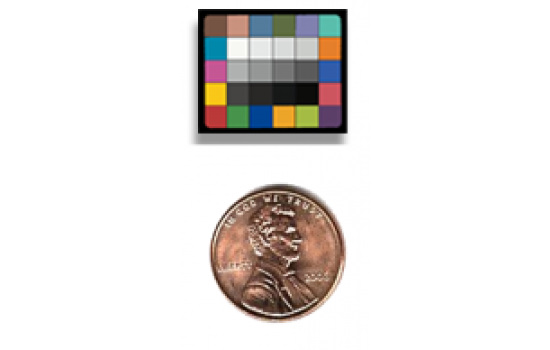 Gloss gray patches have an extended dynamic range (density ~ 2.4) and are suitable for measuring camera imager noise. Specular reflections from the gloss surface may occur for illumination geometries less than 45°/0° when used without crossed polarizers. 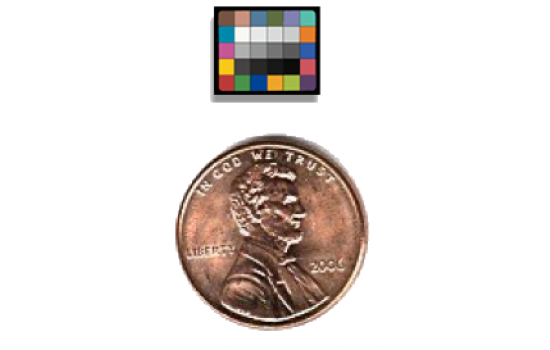 Matte gray patches have a lower dynamic range (density ~ 1.6) but are more suited to narrow illumination geometries such as those used in endoscopic imaging or direct on-camera flash units. Because the matte surface can be interpreted as imager noise, we do not recommend using matte gray patch targets for evaluating imager noise in high magnification applications. Batch Colorimetric information data for the patches can be found at Micro/Nano/Pico Colorimetry Data. NIST traceable calibrations and certificate are available for individual ColorGauge targets at additional cost.